Sherpa for Placer Mines is an engineering-based menu-driven program that uses production and deposit data supplied by the user to calculate a series of engineering parameters, which are in turn used by the program to estimate equipment, labor, and supply costs. The user works through these parameters, changing them as necessary to tailor the estimate to conditions at a specific location. The program is designed to handle up to six production segments. These segments can run sequentially, or they can partially or completely overlap. Deposit constituents can be separated into five separate categories, including topsoil overburden, pay gravel, bedrock and tailings. Different machines can be assigned to each constituent, or each machine can be assigned to two or more constituents. Users may select from a series of pre-designed mineral processing flowsheets or design their own. The software will accommodate either stationary or mobile processing plants. Used equipment can be incorporated into the analysis by simply specifying the age of the machine. The program then adjusts the purchase and operating costs accordingly. Of course these adjustments can then be overridden by the evaluator. All input variables can be changed from one production segment to the next. Items such as daily production rates, mining methods, deposit specifications, wages, salaries, supply prices, equipment types and sizes, and a host of other project parameters can be altered as necessary by the user to meet specific needs. Results are presented in cash-flow format. Revenues associated with as many as five commodities can be considered. In addition, gold values can be adjusted for fineness, as well as for jewelry and nugget premiums. A user's manual fully explains program operations, utility functions, and the algorithms used in the program. Also included is a detailed tutorial example that enables the user to quickly learn how to use the primary features of the program. Help screens are available for each entry. These screens explain the type of information requested by the program and the way in which Sherpa determines its suggested values. Help screens also provide the user with alternative data that can be used to modify Sherpa's suggested values. Complete project output reports may be sent directly to a printer. In addition, program output may also be saved to text files. These files can then be imported into any major word processing program to further enhance printed output. Current supply and equipment prices, operator wages, and staff salaries are contained in a separate database, which is automatically queried by the program. Cost values in the database are supplied by Western Mine Engineering, Inc.'s Mining Cost Service. All prices, wages, and salaries can be easily altered by the user within the operating parameters of the program. 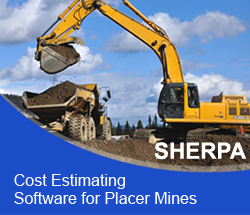 Sherpa software estimates costs using a traditional engineering approach. Users work through a series of screens on which parameters estimated by the software are presented in a manner similar to the progression used in a traditional engineering-based cost estimate. All of these screens are accessed from one main menu. Consequently, users are never more than one step from the menu and cannot lose track of their location within the program. At any time users may return to any of the previously viewed screens, alter input parameters, and view the impact on project costs. To operate the program, the user first enters information regarding production specification such as the size of the resource, the daily production rate in terms of bank cubic yards, the number of hours per shift, the number of shifts per day. Deposit parameters (thickness, density, and swell) for each of the deposit constituents (topsoil, overburden, pay gravel, and bedrock) are specified, as are the overall dimensions of the resource and surface expressions such as side slopes and stream gradients. For each deposit constituent, mining machinery is assigned to the tasks of excavating, loading transporting, placing, and leveling. Milling equipment is also selected from easy-to-use menus, and a flow sheet is either selected or designed. Next, the program suggests preproduction development requirements based upon the production, deposit, and method specifications provided by the user. In addition to topsoil stockpile and overburden stripping requirements, parameters for road construction, clearing, sampling, and diversion ditch and settling pond excavation are also suggested. The program also suggests supply prices, hourly worker wages, and staff worker salaries. These suggested values are reviewed by users and adjusted as necessary for their particular site. The program then suggests all necessary equipment operating parameters. Values for excavation depths and excavator efficiencies are estimated, along with transport profile gradients and distances. These values are based upon equipment sizes selected by the user. Evaluators are encouraged to change any of the suggested values as necessary to emulate conditions at their site. Specific equipment parameters provided by the program typically include weight and volume capacities, bucket or bed fill factors, rolling resistances or efficiencies, and estimated availability. Engineering parameters are suggested next. Items such as the power generation requirements and pumping needs are estimated, as are fuel and water storage volumes, sanitation facility sizes, settling pond and diversion ditch volumes, mobilization distances and project supply weights and frequencies. Building sizes are estimated for a project shop, mill building, storage warehouse, and office. If workers are housed onsite, the program suggests the sizes for dormitories and a cook house estimates daily food and sundry requirements. These last few values are based upon daily manpower requirements estimated by the program. All these variables are displayed for the user and are easily altered to reflect conditions at a specific operation. After the engineering parameters have been defined, project costs are estimated and displayed. Operating costs are tabulated on both a daily and per-cubic-yard-resource basis and are then broken down with respect to supplies, hourly laborers, salaried workers, and capital costs associated with purchasing the equipment and facilities, mobilization, preproduction development, and constructing the surface facilities and the processing plant. Values for working capital, engineering and project management fees, and a contingency fund are also provided, as are the projected equipment salvage values upon project completion and reclamation costs. Finally, revenues from the recovered commodities are compared to project costs on an annual basis. All the production segments are accounted for and included in the resulting spreadsheet, which provides a pre-tax, undiscovered project cash-flow sum. DEVELOPED BY: AVENTURINE ENGINEERING, INC. IN CONJUNCTION WITH THE BUREAU OF LAND MANAGEMENT, ALASKA, AND WESTERN MINE ENGINEERING, INC.
Aventurine Engineering's software is available through CostMine, a division of InfoMine Inc.
To order Sherpa for Placer Mines please contact Jennifer Leinart at InfoMine Inc.